So I am very late to the party but how AMAZING was Vietnam's first EVER Olympic Gold medal? The way in which Hoang Xuan Vinh conducted himself was quite admirable. After his competitor had finished his shot, Hoang calmly took about 20+ seconds to shoot his final shot. 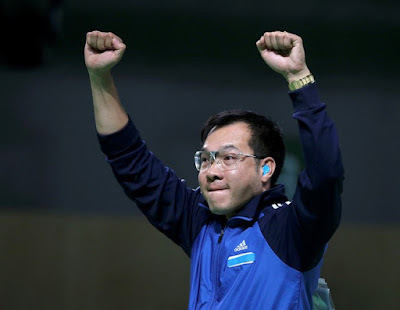 And this was despite the jeers and distractions of the unsporting Brazilian crowd (who quite obviously wanted their silver medalist, Felipe Wu, to win). Not to mention the added pressure of needing a good final shot to round things up as Hoang was trailing Wu by an initial margin of 0.2 (not that he knew that he would eventually require a 10.4+ to secure top spot!). Despite these adversities, Hoang managed to fire home a whopping 10.7 to end things and make his nation proud. Incredible. Congratulations to Vietnam - an historic achievement, their very first.